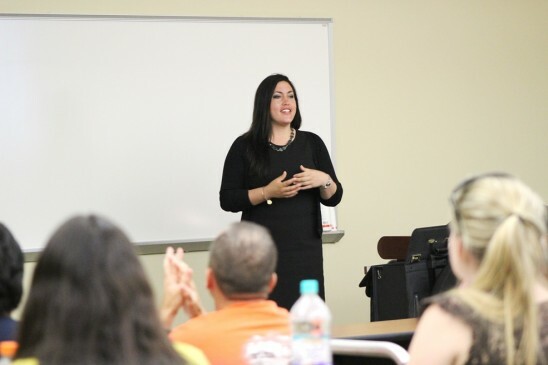 UCF Rosen College alumna, Jennifer Garcia, '09, recently returned to her alma mater to offer career advice to students. Internships with the Vans Warped Tour, the Starbucks VIA Taste Tour, and Super Bowl XVIII appeared to place former event management and hospitality management double major Jennifer Garcia’s career trajectory on a crash course with success after college. However, after Garcia initially graduated from the University of Central Florida’s Rosen College of Hospitality Management in 2009, the alumna couldn’t even find employment as a hostess due to the economic recession in the United States. Fast forward nearly four years later, when Garcia returned to her alma mater to inspire current hospitality students with her story of resiliency, as she went from unemployed college grad to assisting with multi-million dollar celebrity weddings and now a new career in professional sports. Garcia’s relentless pursuit of employment eventually paid off after months of job hunting, when in January 2010, she was hired by a Miami-based event designer. Over the course of her three and a half years of employment with Nuage Designs, Garcia opened an office in New York, created partnerships for destination weddings, and assisted with several celebrity nuptials, including Grammy Award-winner Carrie Underwood and reality TV star Kim Zolciak, whose wedding appeared on Bravo’s The Real Housewives of Atlanta. Garcia again faced adversity in finding employment, as many professional sports recruiters refused to hire her, as she had no previous professional experience within the industry. But again, Garcia refused to give up on her goal, as the alumna continued to submit her resume and attend networking functions. Her resiliency paid off again, as the alumna ultimately received job offers from at least two professional sports teams, and recently accepted a position with the Florida Panthers of the National Hockey League, as a group sales manager. I am very proud of Jennifer, she is an example of life for all of us. Congratulations dear cousin, keep going.